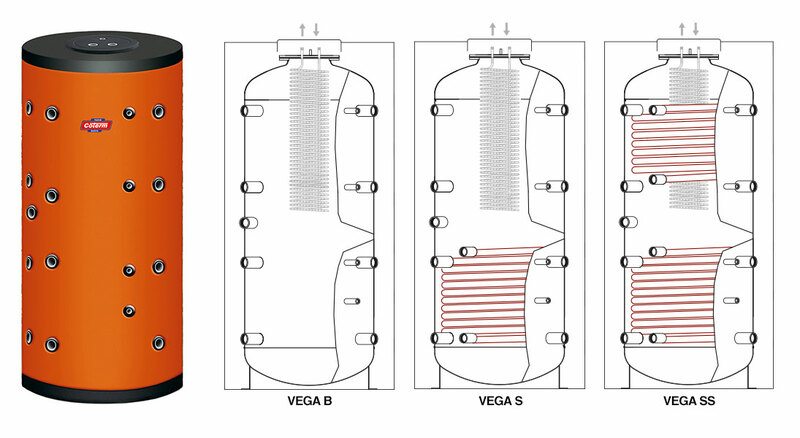 The combined cisterns in the VEGA series are built for storing hot water. Without a coil, with a coil or with two fixed coils, for connection to various heat sources (wood, gas and oil-fired boilers, heat pumps, etc.). An extractable finned copper coil is inserted in the top part of the cistern and permits the instant production of hot water without the danger of legionella. The inside of the recipient is rough while the outside is painted with a water-based rustproof enamel. The flexible polyurethane insulation, 100 mm thick with outer PVC finish, ensures optimum thermal insulation of the water with the reduction of heat dispersion to a minimum. Fill in the form below to be e-mailed the VEGA B – VEGA S – VEGA SS SERIES BOILERS technical data sheets. Thank you.